Is Harley Quinn a Part of 'Arrow''s "Suicide Squad"? ‘Arrow’ Season 2 Shocker: Is Harley Quinn a Part of the “Suicide Squad”? 'Arrow' season 2 has already established that we'll be meeting the "Suicide Squad" in the coming weeks, the line-up of which has already emerged in recent photos, but the promo for the episode that followed last night's epic "The Promise" appeared to tease one major member of the team we've not yet seen. Could Harley Quinn make a stealth 'Arrow' appearance in the near future? Find out what producers have to say! Take this all with a grain of salt, but the 20-second promo for "Suicide Squad" that aired last night deliberately lingered on one shot among the row of cells that comprise the eponymous team. 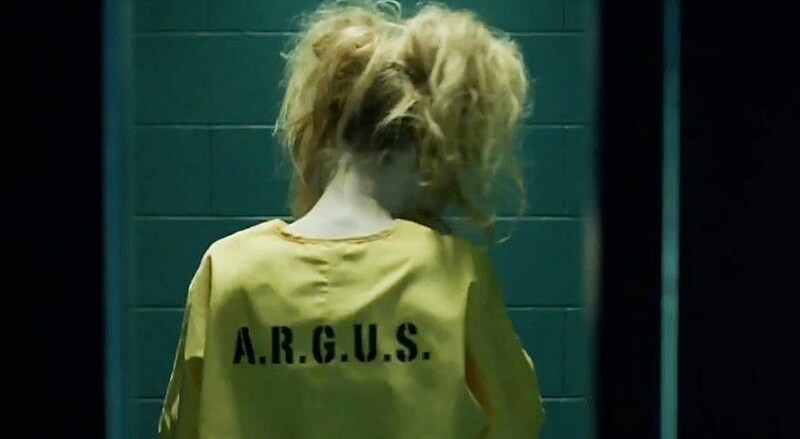 Inside one of the cells that Diggle passed, stood a strikingly blonde woman with her back to the camera, whose hair appeared done up in frayed pigtails that instantly seemed to suggest to fans we might see Batman villain Harley Quinn in the episode. Suggestive as the promo might have been (it also puts into context another shot from the 3-minute trailer of the same woman's black-manicured nails on one hand), here's where things get tricky. We know that recent years have seen Harley Quinn a prominent member of the DC comics Suicide Squad, whose lineup has shifted repeatedly since their origins, and that 'Arrow' has incorporated (or referenced) a number of predominantly Batman-related characters in its two seasons. That said, deliberately featuring the character, name, associated actress and all might step on a few toes of the other ongoing DC franchises in play, including 'Batman Vs. Superman' and any future Batman films, or FOX's villain-tastic prequel series 'Gotham.' Given that the blonde woman doesn't appear in any of the actual 'Arrow' "Suicide Squad" photos of the team in action, we expect that if indeed the character is intended to be Harley Quinn, we may not see the woman's face, or hear her name, instead keeping the appearance a flexible homage. TVLine even suggests we might not see the character at all. It's a lot to take in, and we've included both the photos in question and the CW's own "Suicide Squad" trailer above and below, but what do you think? Could Harley Quinn pop up on 'Arrow' in all her red and black glory, or will we see a mere homage? What do you think the special revelation of episode 219 will be? Check out the teaser below, and give us your 'Arrow' theories in the comments! Source: ‘Arrow’ Season 2 Shocker: Is Harley Quinn a Part of the “Suicide Squad”?